Our goal is to work hard to learn and improve basketball, volleyball or tennis skills and develop a strong sense of teamwork while maintaining a safe, Christian learning environment. We hope all campers will walk away with improved understanding and playing ability. We meet at UBC each morning. After stretching and pep rally, kids are bused to a local CCISD school (basketball and volleyball) or Bay Area Racquet Club (tennis) for clinic time. Kids are divided according to grade for play. We come back to UBC for lunch and devotional time, then head back for afternoon drills and skills. We end our day back at UBC with a video and award presentations! Basketball Camp is led by Coach David Ward, head basketball coach from Texas City and coach at Clear Falls, along with the assistance of other high school basketball coaches. We include great training, a ton of fun, a little friendly competition and plenty of attention from our dedicated leaders and student volunteers. Our Goal: To improve basketball skills and help children develop a strong sense of teamwork while maintaining a safe, Christian learning environment. We hope your kids will walk away with improved understanding and playing ability. Please join us for this fun-filled and educational experience! This camp will be divided into two groups according to age and/or volleyball skills. Aimed at training the beginner on the basic skills and basic concepts of volleyball. We will spend time in team play re-emphasizing the basic skills and concepts. We will also spend a lot of time in team training, working on the skills and situations that were emphasized during position training. Our camp is led by Jennifer Pyle, former Texas A&M Volleyball Assistant Coach; Coach Greg Eanes, JV coach at Clear Creek HS, as well as other adult and student volunteers. We include great training, a ton of fun, a little friendly competition and plenty of attention from our dedicated staff. TENNIS CAMP IS FULL! There is still plenty of room in volleyball or basketball! 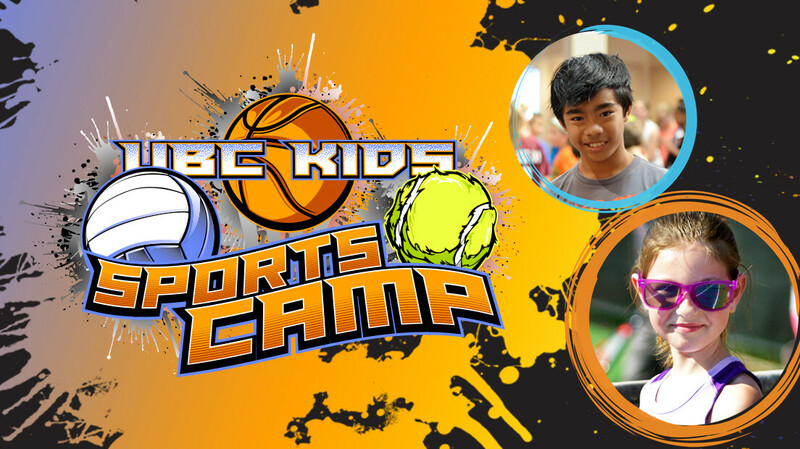 UBC is partnering with Bay Area Racquet Club to provide tennis as an option in sports camp. Tennis camp will be led by the staff at BARC along with UBC student leaders. During the week kids will learn the proper fundamentals: forehand, backhand, serve and volley. By the end of the week they will be able to properly keep score, play points and sustain a meaningful ralley that will build a passion for tennis! Low compression balls and appropriate sized racquets will be utilized to allow for students' comfort in learning. Tons of fun! Some of the sports that will be introduced are Basketball, Tennis, Soccer, Bowling, Football and Cheerleading. Price includes t-shirt, water bottle, and medal. We have partnered with Bushi Ban International and our “Extended Day Option” will include Martial Arts. Price includes Martial Arts uniform and Success Bar. Every summer, we have a great crew of students completing grades 7-12 who serve as staff for Basketball or Volleyball camps. Staff serves from 8:00am-4:00pm daily with additional hours on Sunday afternoon before camp. Volunteer service hours are given for this event. If you are interested in serving, please contact Karen Murphy for more information.